"If you were living in another country and heard that lots of Americans were hungry, would you leave behind your own safety and comfort to return here and serve?" "If you asked a lot of people for help once you got here and they all said no, would you give up? Or would you try and come up with a way to solve the problem without their help?" "What's the difference between a celebrity and a hero?" 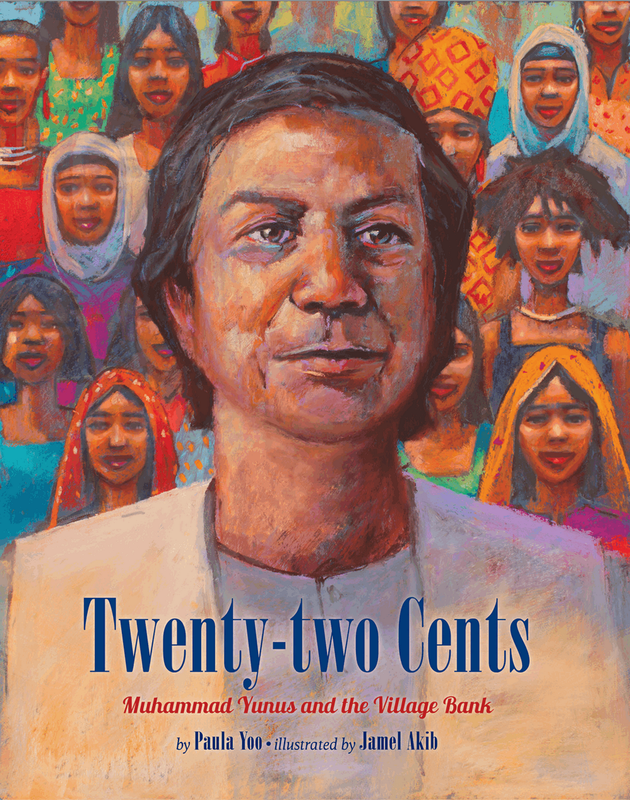 Before reading TWENTY-TWO CENTS: MUHAMMAD YUNUS AND THE VILLAGE BANK by Paula Yoo (Lee and Low) to a group of fifth-graders, I might start by asking questions like these. Then I would launch into the story, letting their eyes linger on the beautiful paintings by Jamel Akib. I agree with Publisher's Weekly's review: "In detailed and inviting prose, Yoo shares the story of activist and Nobel Peace Prize winner Yunus, beginning with his childhood ... Akib’s grainy, jewel-toned chalk pastels contrast a sense of scarcity and deprivation with one of warmth and humanity. Yoo makes the significance of Yunus’s contributions understandable, relevant, and immediate." Without overstating Yunus' humble and yet not impoverished background, Yoo and Akib make it clear that this world-changer didn't come from privilege. Children in all circumstances will be inspired by Yunus' life and by the difference he has made throughout the planet. I pay attention to cultural details about my own Bengali heritage, and Akib didn't disappoint with his accurate depiction of practices like giving and receiving with the right hand, squatting to chat, and sitting cross-legged to learn. In the final pages, he paints a panel of proud young brown women whose faces and postures speak volumes about empowerment and hope. It's been a while since I read a biography aimed for children, but after enjoying this one so much I'm going to look for more. 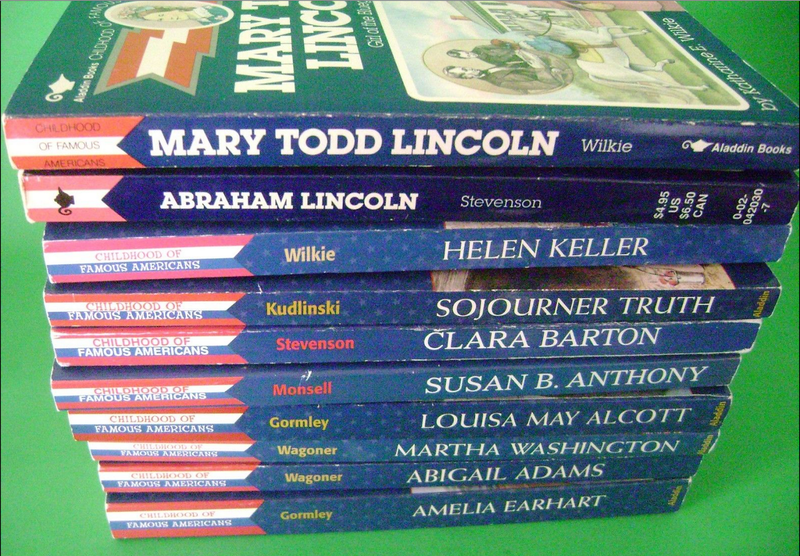 I remember discovering a series in the library when I was in fourth or fifth grade called “The Childhood of Famous American Series” from Bobbs-Merrill. Looking back, I'm surprised by how many world-changing women were featured: I read about Clara Barton, Susan B. Anthony, and Louisa May Alcott. All the books began with a person my age or so who went on to change the world, and as I devoured them I began to imagine trying to make my own mark. I invited Paula to chat with me on the Fire Escape about creating the book and about the power of biography to inspire and inform. Read on to enjoy her brilliance. Welcome, my multi-talented friend. Your website is a dizzying display of diverse talent—music, children's books, television writing. You're a celebrity in your own right. Okay, let's start with an easy question: why did you want to write this biography? Jason Low of Lee and Low Books first approached me about the life of Muhammad Yunus as a possible children's picture book biography. He suggested I read Professor Yunus' autobiography, BANKER TO THE POOR: MICRO-LENDING AND THE BATTLE AGAINST WORLD POVERTY (Public Affairs, 2008). I read this book in one day—I was mesmerized by Professor Yunus' passion and dedication towards helping others left fortunate. His colorful childhood and awakening as an activist inspired me. I agreed with Jason that Muhammad Yunus would make for a great biography to inspire children to learn about compassion and generosity. I read several more books and newspaper/magazine articles about Muhammad Yunus and Grameen Bank. I also interviewed historians and professors who teach college courses about the history and culture of Bangladesh. Most importantly, I had the honor of meeting and interviewing Muhammad Yunus himself when he visited Los Angeles. It was such a privilege to sit down with Professor Yunus and hear his thoughts on how to eradicate world poverty. He has a wonderful sense of humor, doesn't he? I met him briefly years ago when I was living in Dhaka at the book launch party of a dear friend, Alex Counts, the author of Small Loans, Big Dreams: How Nobel Prize Winner Muhammad Yunus and Microfinance Are Changing the World. Alex is the President of the Grameen Foundation, which based in Washington D.C. Okay, moving on. Why do you think that it's important/fun for young people to read biographies? A good biography is not dry and boring. A good biography is a compelling and engaging story about a person's life and what events inspired him or her to follow a certain path in life that would change the world forever. I love a good plot, but I love a good character even more. To me, a strong biography is one that embraces its main subject as a CHARACTER who faces obstacles and overcomes them with his or her clever initiatives, passion and drive. It's important for young people to read biographies so they can learn how one person CAN make a huge difference in our world. It's also fun for young people because they also are entertained by a suspenseful storyline that shows HOW that one person changed and grew as a result of overcoming their obstacles in life. Could you sum up for us the dream response of a reader who knows little or nothing about Bangladesh's history and culture? 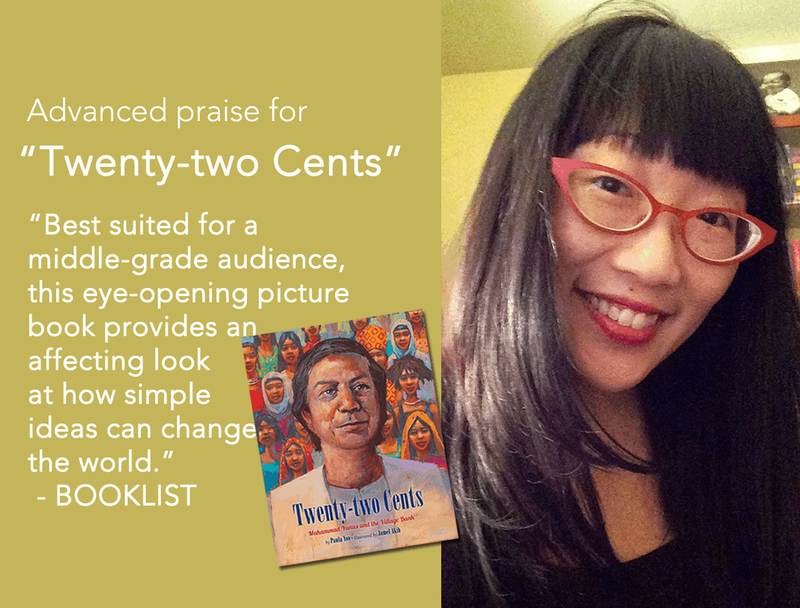 Now let's move to the journey of getting the picture book published. What was a high point? A low point? I researched and wrote several drafts of this book that Jason Low read and critiqued. I revised it quite a bit before it was deemed submission-worthy. The high point was getting the email announcing the exciting news that it had been selected for publication. No matter how many books you write and publish, every new book that is accepted for publication always feels like your first book! It's an exciting feeling that never gets old. I also know picture books can take awhile because you also have to wait for the illustration/art to be completed. So the "low" point was me impatiently waiting and checking my emails obsessively for a sneak peek of the art work! But it was worth the wait - Jamel Akib's art work was phenomenal. His pastels are gorgeous! I went to his website and want to buy all of his paintings. Okay, next question: what was the biggest change you made in response to an editorial suggestion? The biggest change I made in response to an editorial suggestion was figuring out how to increase the presence and influence of both Muhammad's mother and father on his growth as a child learning how to become more compassionate and generous. I had focused more on his mother and then was asked to research his relationship with his father more. As a result, I feel the parents' portrayal is much richer and add more depth to what drove Muhammad to become such an advocate for the poor. Yes, I completely agree. Could you describe a fear you have about this picture book that can keep you up at night? As a Korean American, I wanted to make sure the portrayal of Muhammad Yunus and his country of Bangladesh were portrayed in the most accurate and authentic way as possible. I channeled into the universal themes that connected me as a human being to Muhammad's life—focusing on the universal themes of his life and his country's history helped me as I triple fact-checked everything. I also found it quite challenging to sum up the history of Bangladesh in such a short amount of text because this was written in the genre of picture books for children, which requires much brevity. Bangladesh has a complex and rich history and I did not want to cheat that historical depth or write anything that was too short and out of context. So I wold say my fear was really more of a concern to make sure Muhammad Yunus and Bangladesh were portrayed in the most authentic light possible. This book proves without a doubt that authenticity doesn't depend on having the "right" ethnic credentials (whatever that means), but I'd like to explore how much Jamal's Malaysian heritage informed his gut about life in a Muslim country. I'd love to find out what kind of research he did about Bangladeshi cultural practices before finalizing the art. Maybe I'll invite him out here someday. Last but not least: what's next for Paula Yoo in the creative realm? I'm working on a bunch of manuscripts-in-progress, from a new YA novel idea I have to a couple adult novel ideas, as well as some new picture books (researching new biography topics). I'm also working on a special children's book project that I can't announce yet but stay tuned! :) I also am a TV producer so I'm currently writing for SyFy's DEFIANCE. As for picture books, I host the very popular NAPIBOWRIWEE (National Picture Book Writing Week) event every May 1-7 in which I challenge writers to write 7 picture books in 7 days to help defeat procrastination. (That way everyone has 7 rough drafts they can then pick and choose to revise for the rest of the year!) I feature fun Q and As with published picture book authors and writing advice, plus a fun contest featuring some awesome autographed books from myself and others. The next event takes place May 1-7, 2015. Thanks so much for spending time out on the Fire Escape with me, Paula, and for writing this book. God bless you and your work in 2015!